Use Perfect Property to find your next perfect house to buy in Sandycove. Sandycove is a delightful seaside town located 13.8km south east of Dublin’s city centre. It is about a 40-minute drive by car via the R118 Motorway. The DART and a number of Dublin Bus routes primarily service the area. Sandycove is a popular resort as it is in close proximity to both the city centre and neighbouring villages. Sandycove is rich in traditional architecture and old-world character. Homes reflect the town’s literary past, and structures are fashioned in James Joyce style. Residences enjoy fantastic views of a picturesque sea, beautiful Dublin Mountains, blossoming gardens, leafy terraces, verdant parkland, manicured landscaping and ponds, mature trees, the glistening Dublin Bay, and private acreage. Many homes are situated near the attractive village centre and the sea, making Sandycove a scenic walking town. Home styles are Period inspired, and one can expect to find styles of Victorian, Edwardian, Georgian, Tudor, cottage, modern, Mansion, Estate, and contemporary. Newly constructed and refurbished homes are outfitted in modern amenities, luxurious décor, spacious living areas, and energy efficient technology. 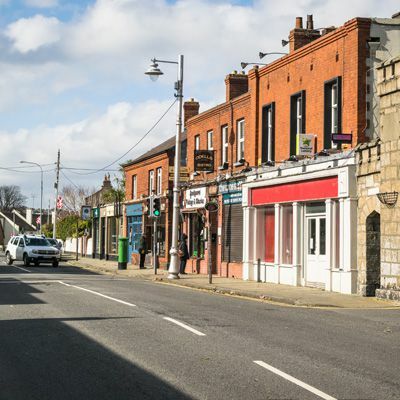 Sandycove is equipped with a few local retail and convenience stores, but it is in close proximity to larger retail shopping, such as Dun Laoghaire Shopping Centre, Leopardstown Shopping Centre, and Bloomfield Shopping Centre, to name a few. Sandycove has several delicious restaurants, cafes, and pubs, many of which serve catch-of-the-day specials. The town is notable for its beautiful seaside recreational and leisure activities. Walking and picnicking trails are plentiful, and a green area allows for extensive views to Howth. Sandycove beaches stretch from the 40 Foot down to Dun Laoghaire Pier. Sporting activities include sailing, swimming, kayaking, boating, Sandycove Tennis & Squash Club, hiking, and cycling. Sandycove is a small, community-oriented town with several primary and secondary schools. The town is notable for its academic excellence and parent participation. Sandycove school awards include Neighbourhood Awards, Universal Design Grand Challenge Student Awards, and Young Social Innovators Awards. You can filter Sandycove properties by price, bedroom size, square footage and more. There is also the option to filter by a property must-have, such as a view if you are seeking a house to buy in Sandycove where you can look at the sea from your home, or even an attic or a large kitchen. You can also check apartments for sale in Sandycove if you are looking for something a little smaller. Don't let the perfect apartment, townhouse or house for sale in Sandycove get away. Looking to rent in Sandycove? Search houses for rent in Sandycove and filter by home types, price and size.